What has happened to our plants? Alycia came running over "Louise, come with me! Want to show you something!" 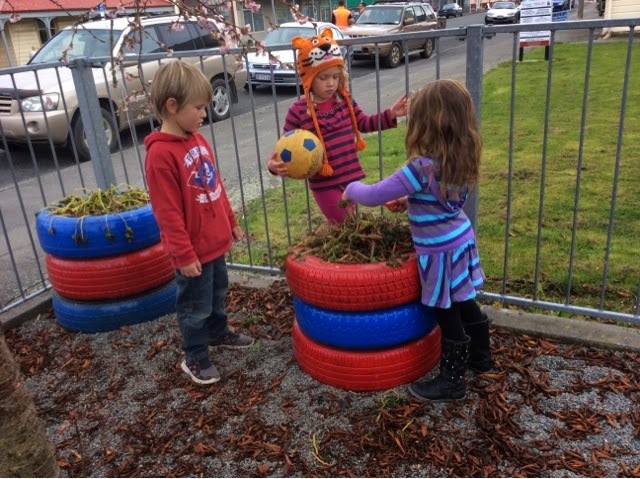 Bettina, Alycia and Drew found the plants in the tyres drooping down. "What has happened to them?" they asked. The plants have been a fabulous show of colour through the warmer months and they certainly did look different now! 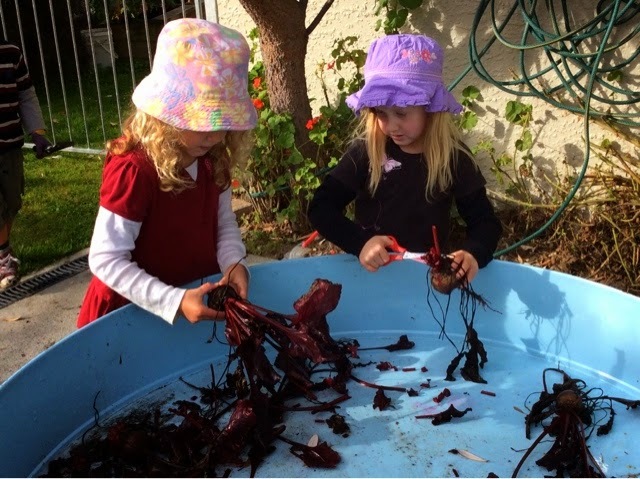 Children are naturally curious in what happens around them and will ask the questions when they don't know the answer. "Its colder!" Alycia quickly replied. I continued to explain that the frost in the night is so cold that the plants are unable to keep upright any longer and we can help them by cutting them back and let them settle over the winter so they can grow again when the weather is warmer. Alycia ran to retrieve some scissors to prune the plants. And the gardeners began to snip the plants back taking responsibility for the caring and nurturing of living things in their environment. 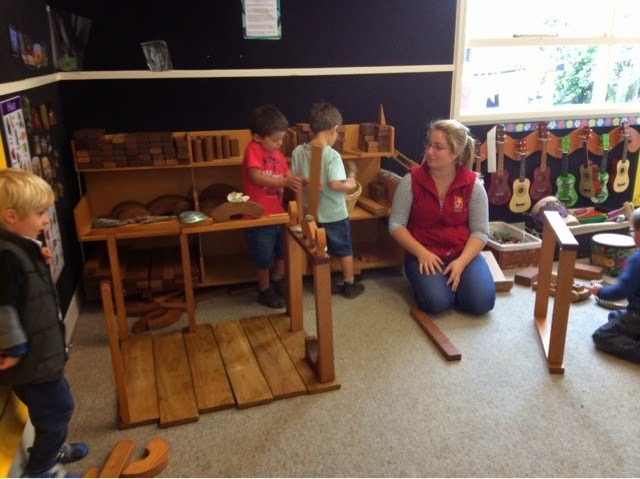 We are very fortunate to have parents offer to come in and work with the children to make things. Today James (Harry's Dad) arrived with wood and iron to contruct our compost bins (Ben drew the plan). 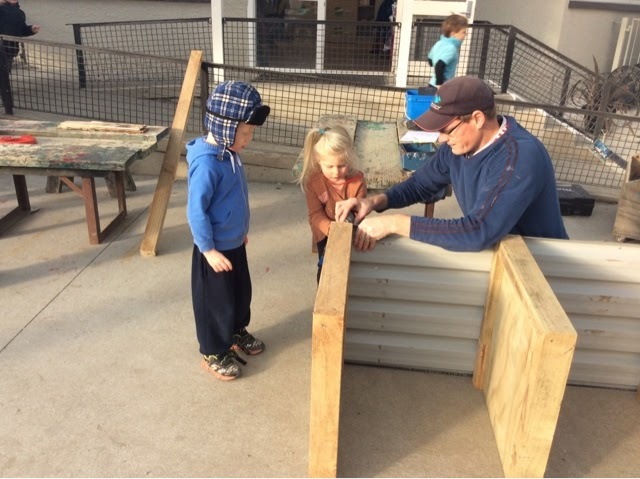 We found that the habit of striving for accuracy was really important when constructing compost bins. 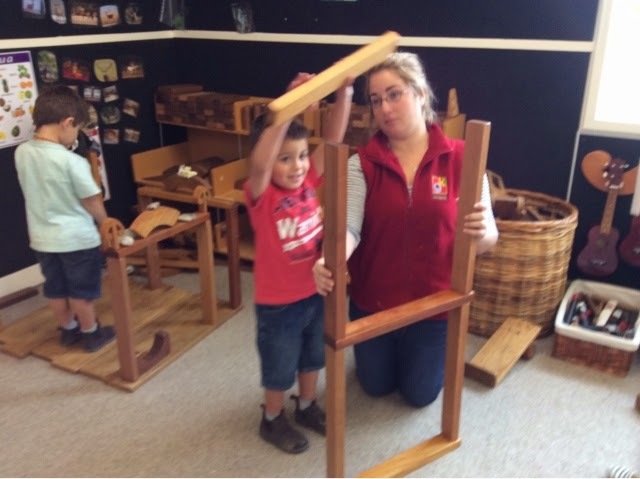 James used a ruler to measure the pieces of wood to fit perfectly and we noticed how closely we had to work together to get the corners to come together with accuracy. 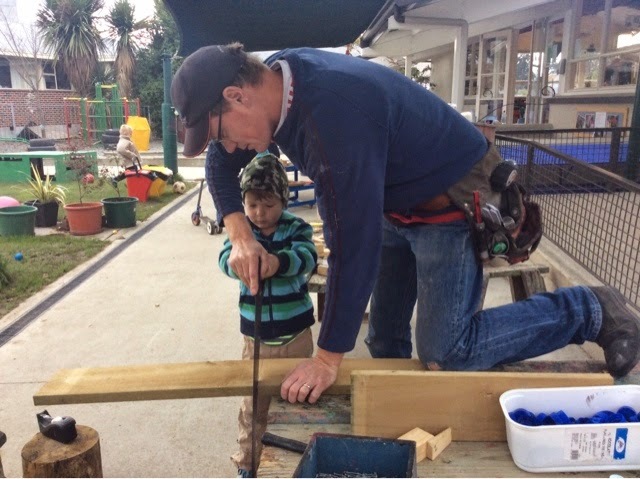 Harry noticed his Dad nailing a large nail in at an angle and quickly followed his lead. James said, "Wait Harry, that one won't go there. It doesn't need to be reinforced!" Harry stepped away and asked, "But you did that?" 'Yes Harry, I did but I needed to make that part stronger." Harry was happy then, understanding his Dad's explanation. Manaakitanga is so evident between Harry and his Dad. 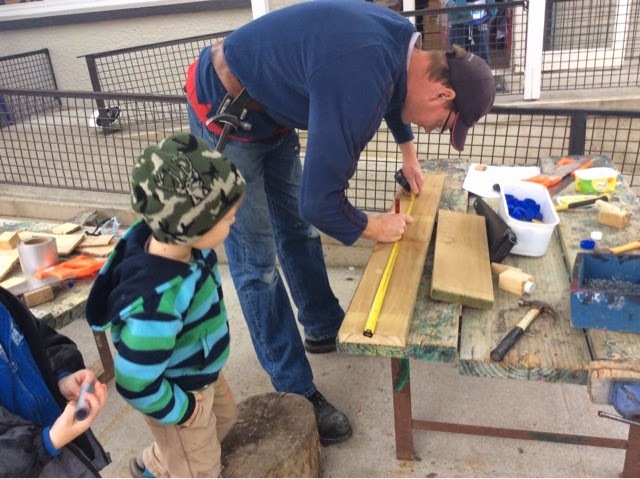 Other budding builders got totally involved; Issac used a real saw with James' guiding hand, "Push it right down and pull it right back up again. Like this!" Issac worked really hard. The hammer hands were on track too as the bins began to take shape. Issac P said "I'm a builder like Pete (Issac's Grandfather). He lives up on the hill." 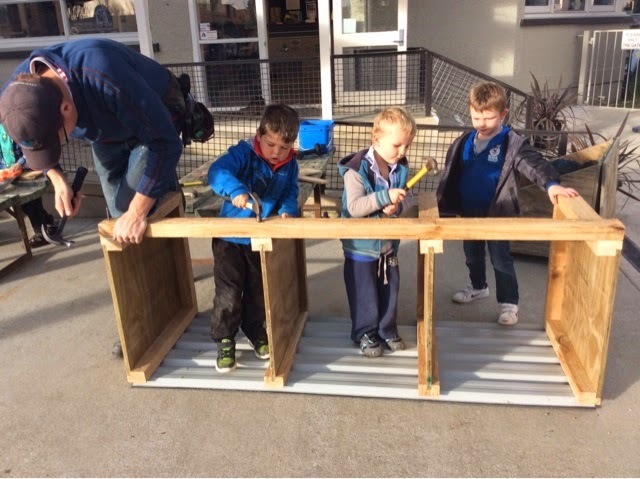 A huge thanks to Harry's Dad, James, for taking the time to come in and construct the bins with the children. They love being involved in real work and being with a 'Dad' and doing what Dad's do. The rubbish truck is on its way! 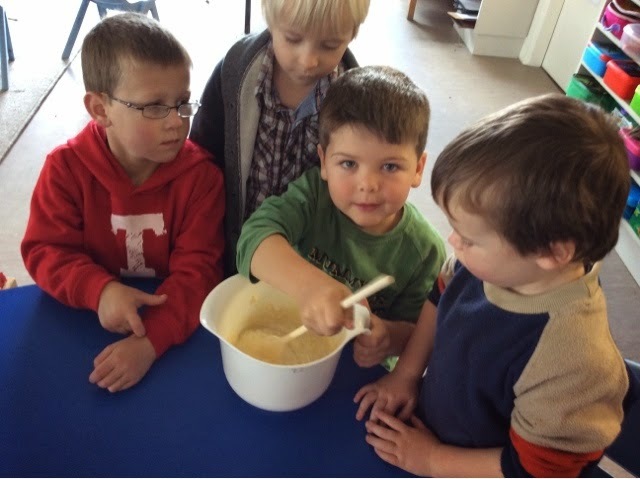 The ideas that children, and in particular our boys undertake show how they like challenging themselves. 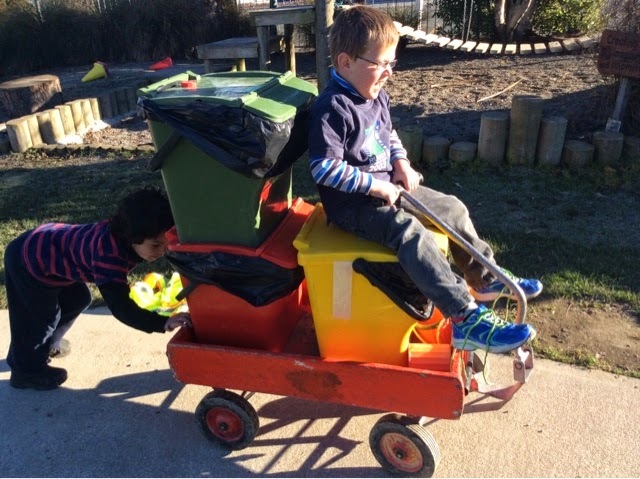 They love the large equipment and the rubbish bins were perfect as they initiately pulled the trolley to give Mason a ride around and when he decded to get off James climbed aboard holding the trolley handle that meant that the trolley needed to be pushed from behind. Demain reacted staight away and the look on James' face was full of excitement as he gripped the handle tightly and steered the trolley around the track. Mason was just as excited when he spotted James's idea and began to climb back on the rubbish bins while James was already installed. Mason was a little upset. He wanted his turn back again! Standing back and allowing the trolley to do a round trip he joined Demain at the back to push together where they decided one was the brake and the other the accelerator. And that is the beginning of another chapter! 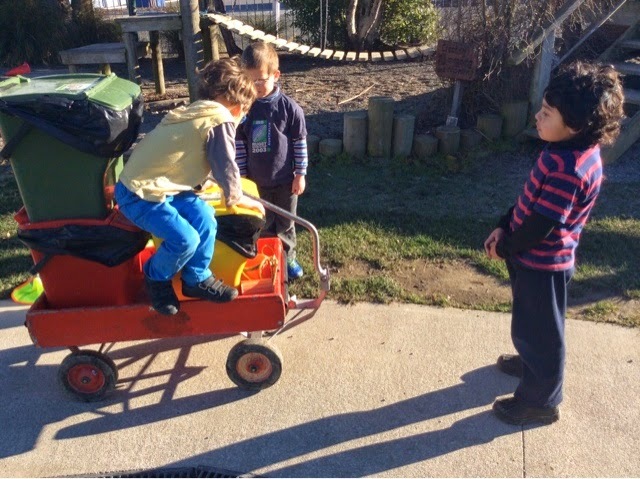 The boys were working interdependently that made the play a success. But significantly, when they are working together there are moments when things don't quite go to plan. The experience gives opportunity to try out different strategies to figure out what to do. Mason sitting to watch the trolley go round gave him time to decide he wanted to keep playing with James and Demian and grasped the back of the trolley to help push. 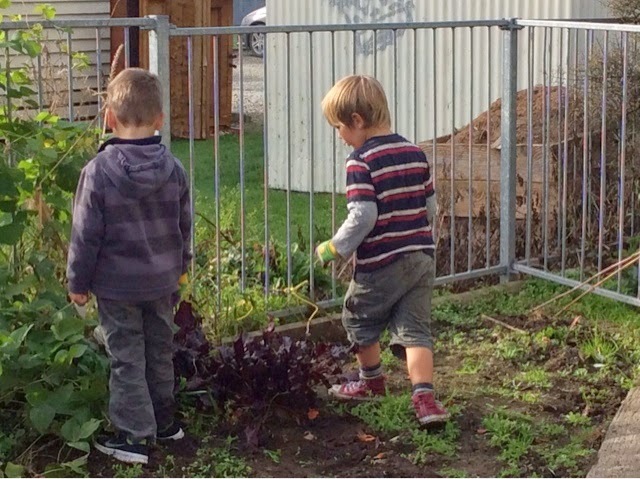 We often see boys learn by doing as they often like to work things through before making sense of things. Ka pai mo to mahi nga tama! Great work boys! 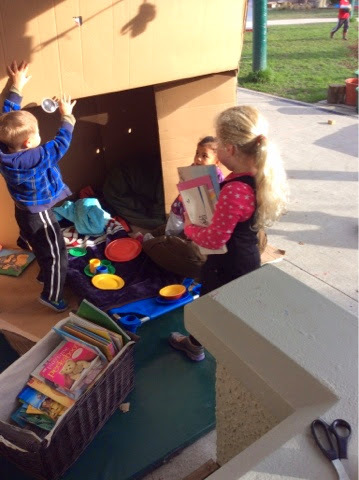 After being given two gigantic boxes yesterday, children immediately returned to play with them this morning. 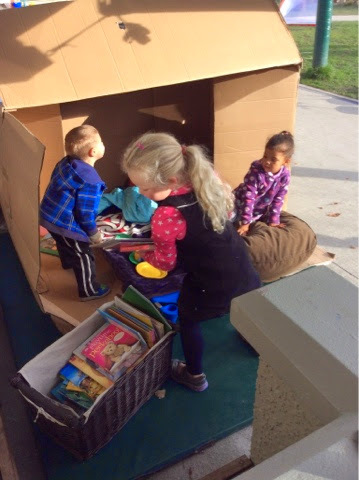 One box had been set up with bean bags, crockery, and books - after a short time the children decided that they were going to move house and shifted every item from this box to the other one where they set up their house! Moving house was a big job - everyone helped out carrying small items and then all working together by carring the table, bed and book basket. 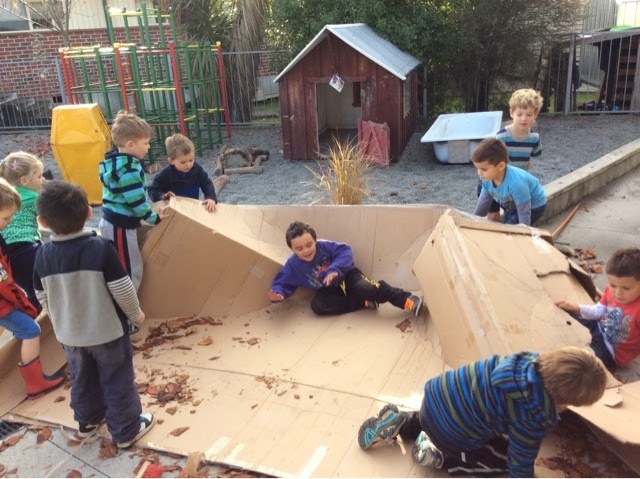 Not long after group of boys came across the empty box and decided they were going to turn it into a skate park. 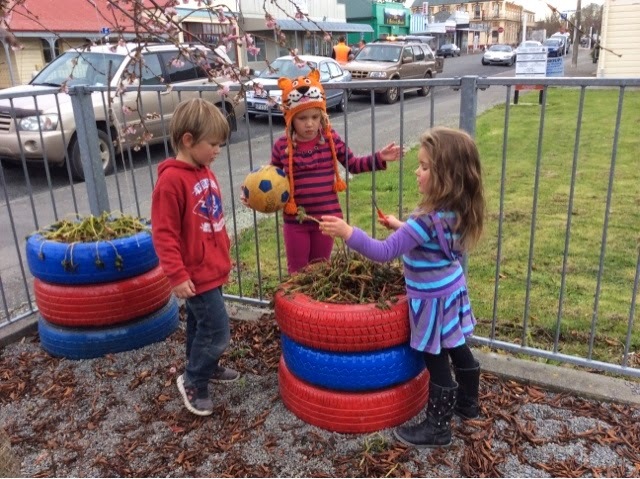 Ketahi te whakaaro pai - That's a good idea. Part of the box was squashed so that a ramp could be made - how creative!! 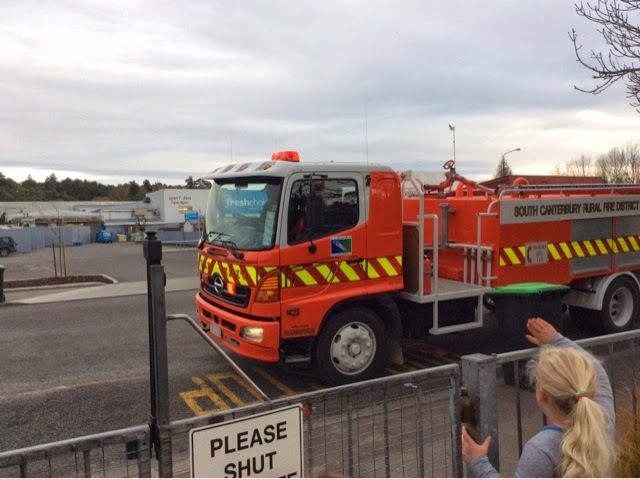 A lot of fun was had sliding down different ramps, everyone negotiating their turn while ensuring that they showed manaakitanga(care and respect) to ensure the safety of everyone. 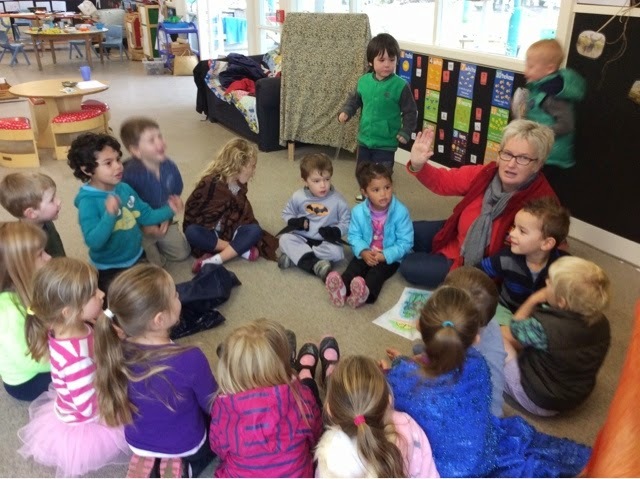 WOW what an exciting day we had at Geraldine Kindergarten! 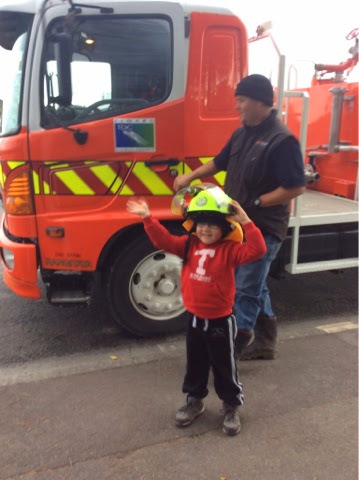 One of our friends, James, gwas dropped off at Kindergarten in a fire engine - a rural fire fighting truck! Everyone gathered outside to watch James as he got out of the truck in his fire hat and make his way to greet us at the gate - dressed in his fire helmet! James' Dad along with another fire fighter came and chatted with us as we all stood along the fence admiring the engine and James in his helmet. When it was time for them to go they got up into the fire engine and drove away with their siren going - what an awesome way to say ka kite. Abigail commented after they had left - "WOW that was so cool!" she said, responding with wonderment and awe, excited by what she has just seen and heard. We had more visitors this morning, some throughtful truck drivers from Mainfreight asked if we would like some boxes that they had in the back of their truck. E iti noa ana na te aroha - Small gift given in love. 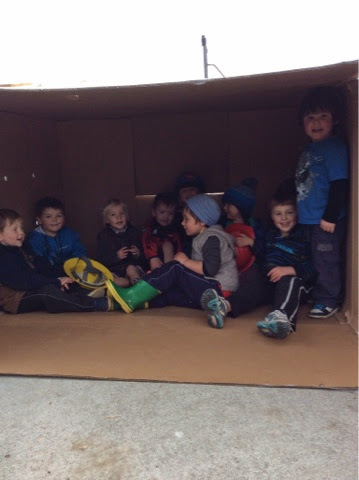 The children had fun playing in these boxes, using their imaginations, negotiating, laughing and just having fun! 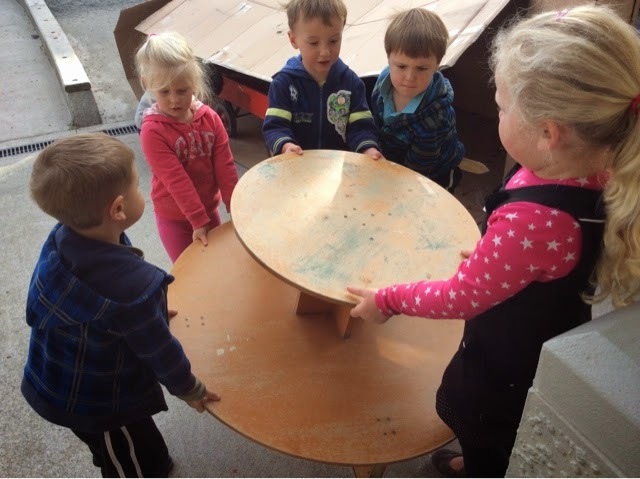 Revisit our BLOG to see what how the children play with these boxes when they come back to Kindergarten tomorrow. "How did the blood get there?" We had a quick conversation about blood being inside our bodies and only coming out when we get a cut or a graze, while together we put a plaster on Lance's toe and that was that off he went back to play. 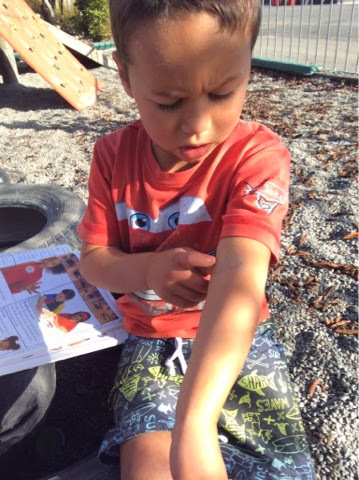 As a teacher I made the most of Lance showing an interest in the blood that was coming out of his toe, and gathered some books about human bodies and approached Lance with them. Immediately he stopoed his play on the swing and sat down in the stones engrosed in the first page of the book, Lincoln sat alongside him and looked at the pictures while asking questions about the skeleton in the book. "Thats like my arm that I broke" lance shared pointing the the arm on a skeleton. "To raise new questions, new possibilities, to regard old problems from a new angle, requires creative imagination and marks real advances..." - Albert Einstein. So of course this is exactly what we did. 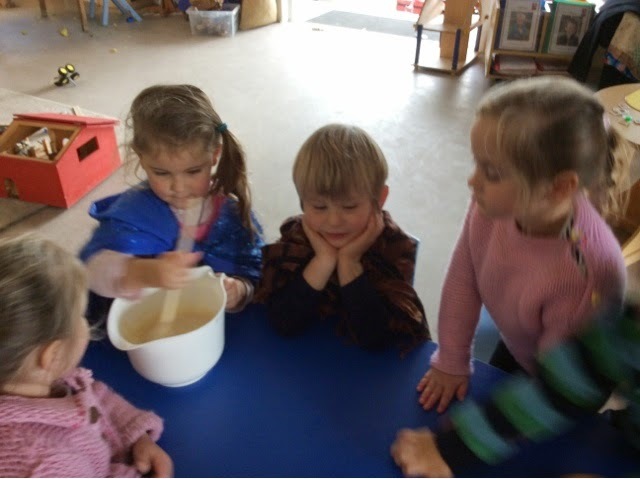 Take a look at them making some tasty pancakes which they enjoyed for lunch! 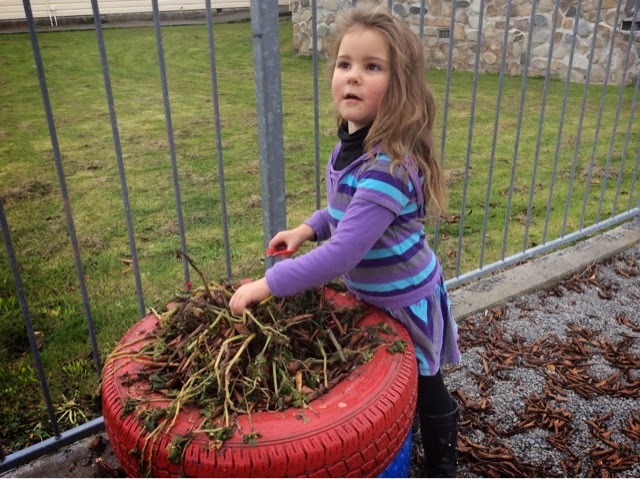 This morning as the rain started we noticed an influx of children inside so Gael got out some of her resources that the children do not get to see a lot and played some group games. 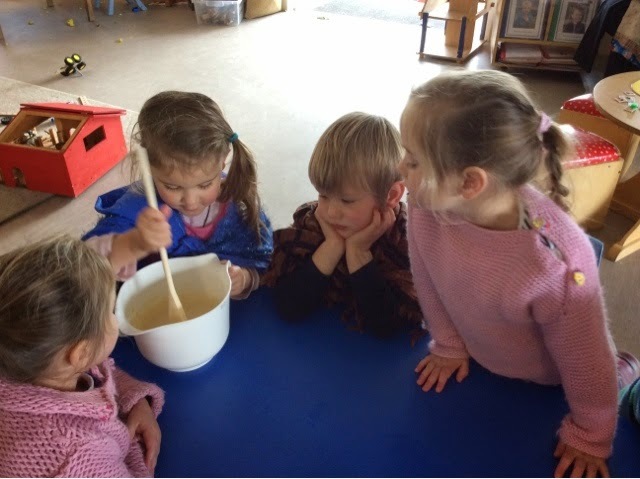 The children noticed other children playing and curiosity got the better of them so they joined in too. There was a lot of managing impulsivity as children had to wait for their turn, or their character to be sung about. Another habit of mind that the children used a lot in these games was meta cognition, thinking about their thinking as they had to think about what character they were and then think about taking their turn. Tino pai rawa atu, excellent. 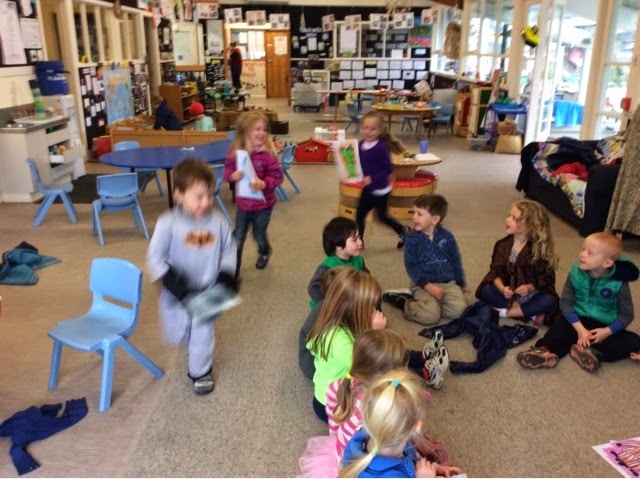 As we played this game lots of laughter and humour was shared between the children and their friends and teachers. Mahia te mahi, be actively involved. Today the children have been busy creating inside with our building blocks. Baxter, Murphey and Guy worked together to create a tower out of the blocks and then added natural resources to the top of their castle. 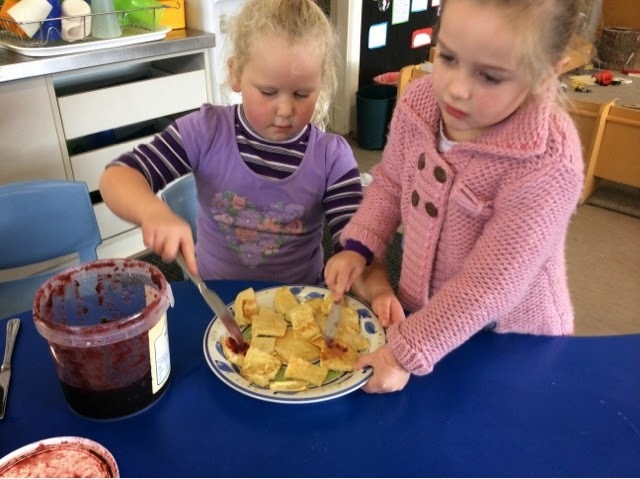 There was a lot of perserverance and problem solving going on as the children discovered some of the blocks were different lengths and when they tried to balance the top block on the other two blockes it slid off. 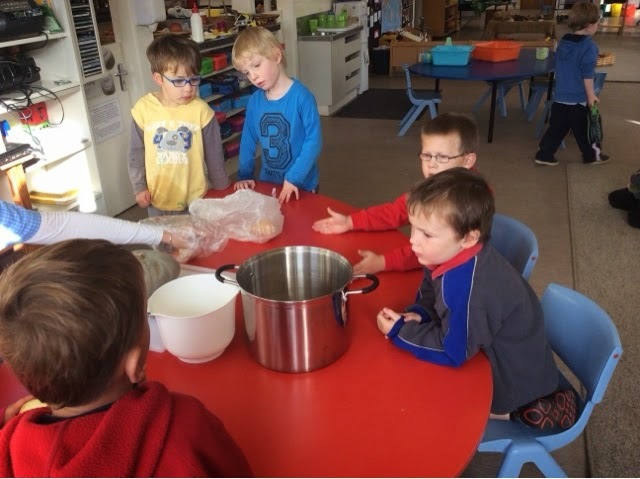 Ka pakeke te haere kaua e hemo, when things get difficult dont give up, and the boys certainly perservered untill their idea had worked. 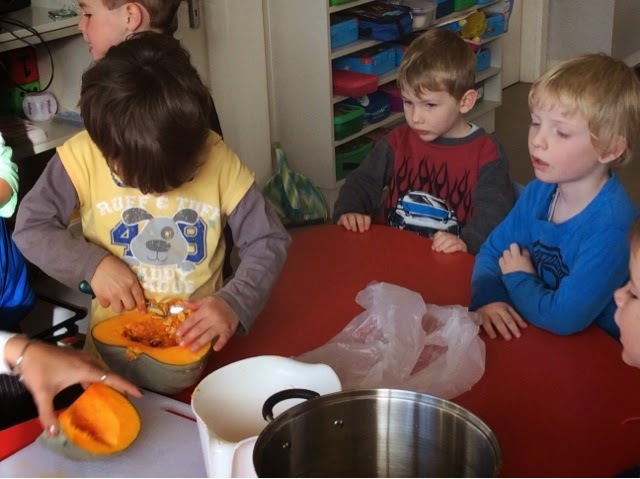 This week the tamariki have been busy harvesting the last of the summer whenua hua from the garden. Beetroot were dug out and beans picked. 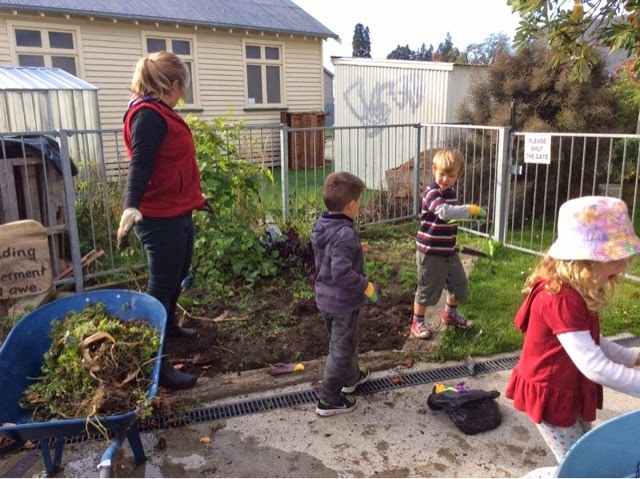 Children worked interdependently to clear the garden in preparation for winter vegetables and spring bulbs. 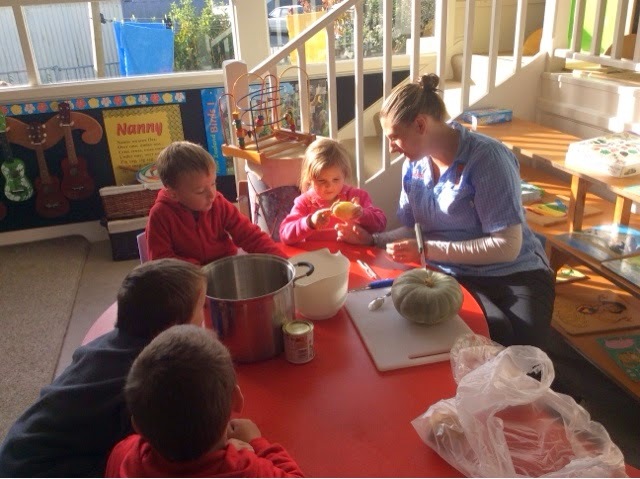 Each week a small group of children are involved in nohonga tahitanga, exploring the community. So, today a trip to the plant shop was organised to purchase winter seedlings and daffodil bulbs. 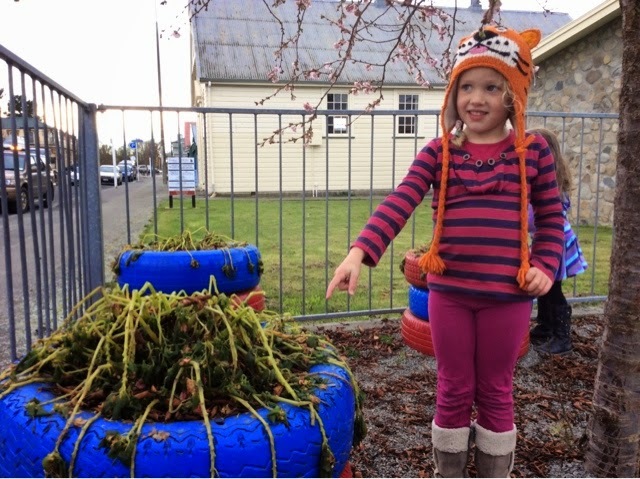 The tamariki are now looking forward to getting these into the garden next week. Kei te hia Kai koe? Are you hungry? 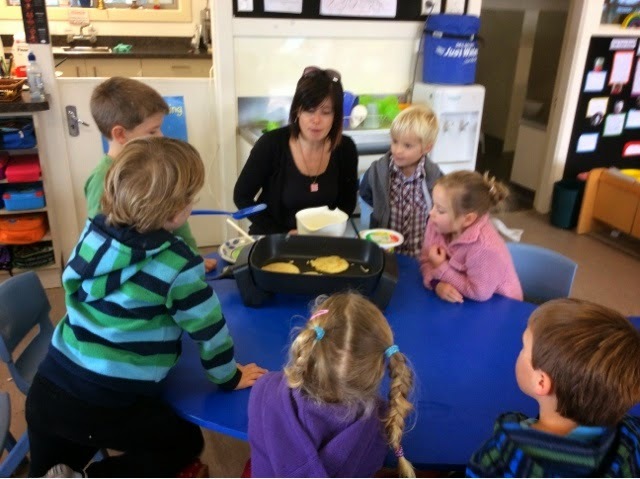 Nau mai, haere mai Sandra, a very special welcome to kindergarten as a permanent teacher . Sandra has been relieving for us for the past two years so knows most of our children and whanau well. 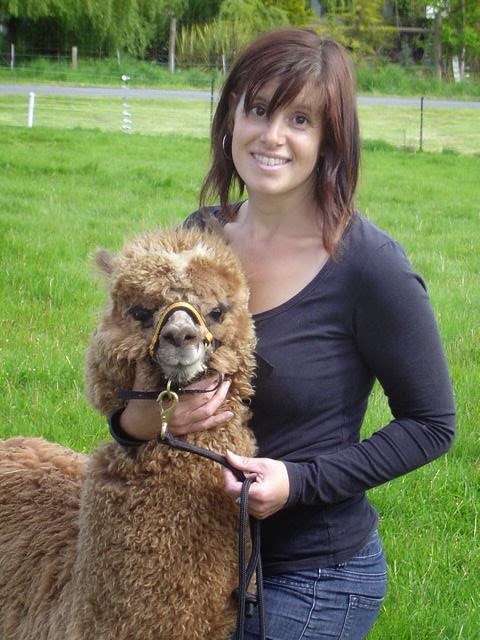 Sandra will be teaching at kindergarten every Tuesday and Friday when Tracey is away. Ashleigh is still person responsible on those days. It is lovely to have you part of our team Sandra ,on a permanent basis! 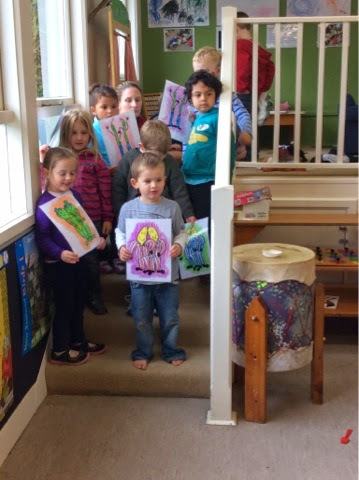 Tēna koutou and welcome back to Term 2 at Geraldine Kindergarten. We open at 8.15am on Monday 5th May for the morning session. Afternoon session begins at 1.15pm. The autumn season is well and truely upon us and so please make sure warm hats and coats are packed in the backpacks. We have new Kindergarten labels tp place on the children's back pack. It's going to be awesome to identify all the individual bags. Remember to name lunch boxes too. 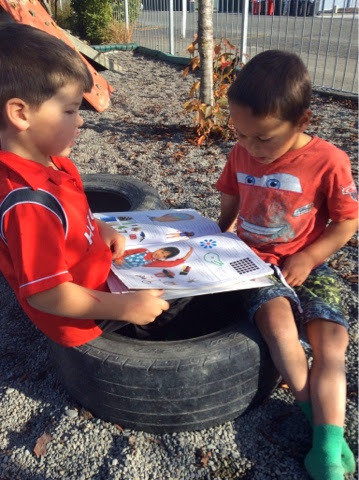 Any opportunity for children to read their names can only enhance reading skills and sense of belonging.